Do You Need Sales Training or Curiosity Training? He challenges all of us to engage in more disruptive thinking by simply getting more curious. Grazer has engaged in hundreds of “curiosity conversations” with people from all walks of life. Those conversations rewarded him with the gift of perspective, new insights and different points of view. They enhanced his ability to find great stories and make great movies. His book disrupted my own thinking around sales training. Perhaps we are working on the wrong end of the problem. Instead of teaching salespeople how to ask provocative questions, perhaps we need to focus on enhancing their curiosity. Curiosity is the underlying skill necessary for wanting to understand what makes a prospect or customer tick. Curiosity makes a salesperson ask questions, rather than give quick answers. It’s interesting to note that curiosity is the supporting skill in the development of empathy. As Grazer points out, you have to care about someone to wonder about them. When you sincerely wonder about a person, you naturally ask more and better questions. 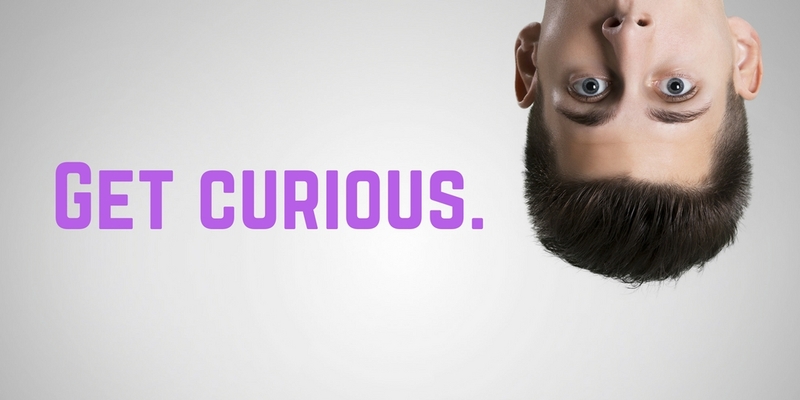 So when and how do salespeople lose their curiosity? What causes a salesperson to run on autopilot rather than curiosity pilot? Familiarity. A salesperson meets with a prospect and hears the same issues that he heard in the previous five appointments. Instead of being curious how these SAME challenges affect this prospect, the salesperson assumes to know the answer and stops asking questions. He’s no longer curious. “Curiosity killed the cat” flips in this case. The lack of curiosity kills sales results and your prospect says “no.” Why?Because your recommendations based on assumptions, rather than curiosity, didn’t hit the mark. Curious salespeople show up to each sales meeting understanding that they will hear similar pains from prospects. However, they are intently curious about how that challenge is affecting this prospect. Curiosity eliminates generic sales calls and generic solutions. You hear a “no.” The autopilot reaction when a prospect says “no” is disappointment, anger or blame on your company’s pricing or product offering. There is no curiosity about the real reason you lost, so you keep losing because you never uncover the root cause for a prospect telling you no. Curious salespeople want to know why they got the “no.” Was it their selling style? Did a competitor outsell them? Is it the product? Is it the prospect? Curiosity leads to learning, which leads to change and different outcomes. Get curious. It leads to a bigger life and bigger sales.